This week, we are going back in time 30 years to Walt Disney World in 1984. My dad found a bunch of stuff from our vacation at The Walt Disney World Village (2014: Treehouse Villas) in 1984. I plan to share a lot of this information with you just to show the amount of changes that have occurred at Walt Disney World in the last 30 years. Back in 1984, there were only two parks (The Magic Kingdom and EPCOT Center). Three Magic Kingdom resorts: The Contemporary, The Polynesian, and The Golf Resort (2014: Shades of Green). No EPCOT Center area resorts. Villa style accommodations in The Walt Disney World Village (2014: Downtown Disney) and a half-dozen “Good Neighbor Hotels.” Today’s article is going to focus on the busing to and from these resorts and parks. All of the bus routes could fit on a handy 6 inch by 6 inch card which was inserted into your welcome packet. How could all this information fit on a small card? Well, there were only 14 bus routes through all of Walt Disney World. As you can see from the first image, the bus had a flag in the center of the grill to signify what bus route it was taking. 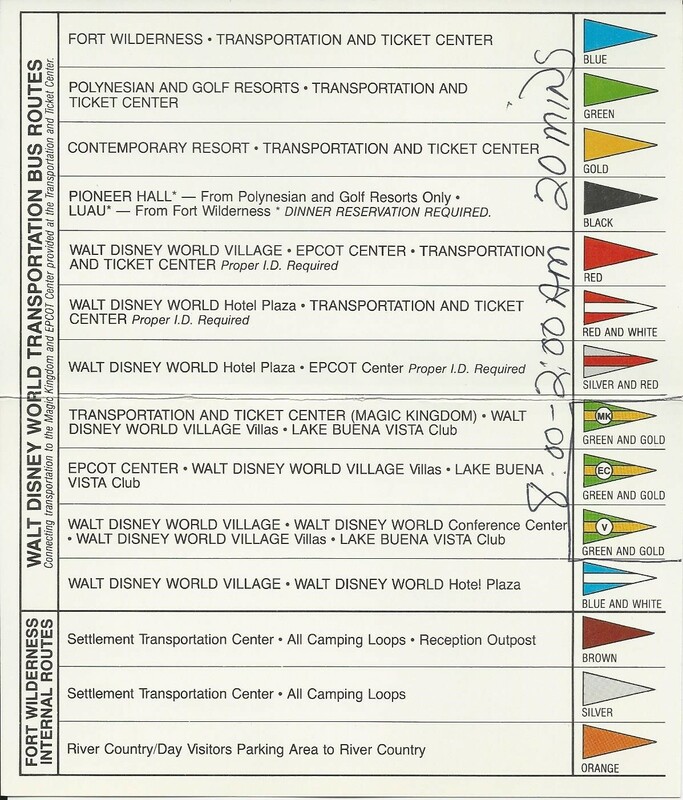 Solid colored flags were used mainly on the routes which took guests to/from resorts and The Transportation and Ticket Center: blue for Fort Wilderness, green for Polynesian and Golf Resort, gold for Contemporary, red for Walt Disney World Village, and brown/silver for Fort Wilderness internal busing. The multi-color flags were reserved for the “Good Neighbor” hotels or Walt Disney World Hotel Plaza as it was called. The hotel plaza included, at the time, a Hilton, Americana Dutch Resort, Howard Johnson’s, Buena Vista Place, Hotel Royal Plaza, and The Viscount Hotel. These hotels were accessible by the blue and white striped flag which took guests only to the Walt Disney World Village. 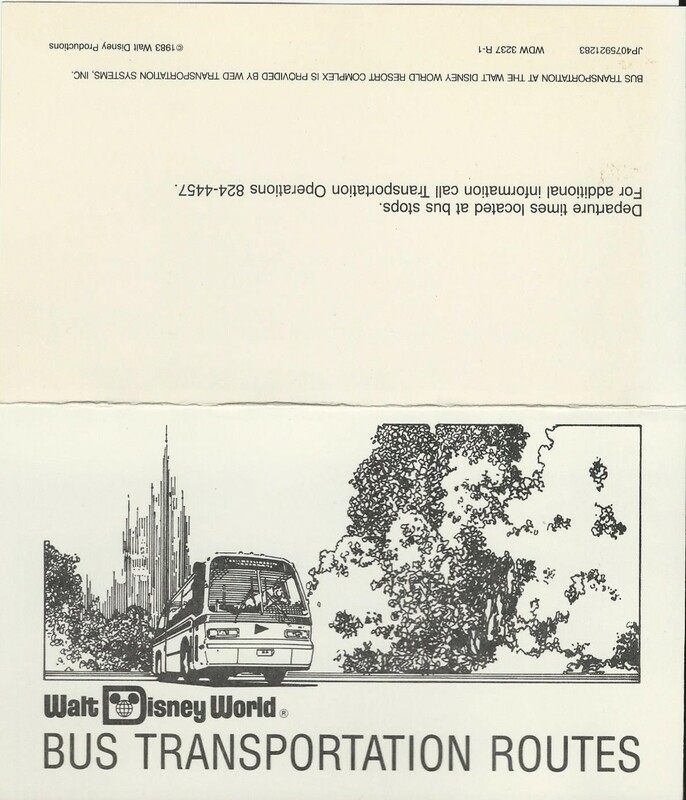 Guests at the Hotel Plaza needed to take a red and white flagged bus to get to the Ticketing and Transportation Center or a silver and red flagged bus to get to EPCOT Center. Guests at the Walt Disney World Village had three different buses to take them to different locations within Walt Disney World. All the flags were green and gold but had a different identifier in the middle of the flag. MK took guests to the Magic Kingdom. EC took guests to EPCOT Center while V was an internal Walt Disney World Village loop. Sounds very confusing doesn’t it. The only thing that the bus system from 1984 has in common with the bus system of 2014 is the buses ran about every 20 minutes. Could you imagine if Disney stuck with the “flag system” for busing today? There would be flags of all sorts of colors and striping. You would need to the bus guide with you at all times just to remember which bus went where and where else it stopped. Disney made a great move to go with banner above the bus which says where the bus is going. 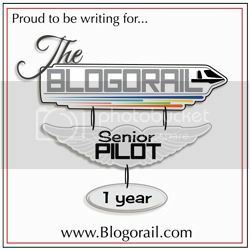 Do any of the readers remember this bus system from 1984? I didn’t remember the flags but just remember that it took a long time to get from the Treehouse Villas where my family was staying to get anywhere on Disney property. If you do remember, please leave us a comment. Thanks for taking a brief look into the confusing busing system from 1984. Tomorrow, we will take a look into Disney’s advertised park tips and dining selections around EPCOT Center in 1984. Fascinating look at Disney history! Thanks for sharing! That is pretty cool. Love the flags.